Since returning from the Gamble House chair class at Marc Adams, I have been thinking through the construction process for a full set of 12 chairs. In the class, we performed many of the operations with hand tools which can be time consuming and lead to variation in the parts, especially across 12 chairs. We also used the Domino 500 for several of the joints, which I don’t own. One aspect of the project I have been pondering is cutting and cleaning up of the curves on the wide faces of the back seat apron, crest rails and back slats. In class, we roughed these in using the bandsaw, then cleaned them with various hand tools. I’m not very good with hand tools, so this is a very time consuming process for me that will lead to irregularity in the finished parts. As I spent time researching and thinking through various ways to machine cut these parts, I developed and then rejected several ways that I might accomplish this. My first thought was to utilize my shaper to pattern cut the parts to templates. This is the same concept used when pattern routing parts, only with bigger tooling. The advantage of utilizing the shaper over a router for this operation is that the larger shaper cutters leave a much smoother finished surface when complete. My first thought was to simply stack rabbeting cutters, which would work but might lead to tear out issues since some of the cuts climb the grain slightly. I then investigated helical shaper cutters like the Byrd Shelix, which would leave a much smoother surface than a straight cutter but are costly. Ultimately I could not come up with a good way to cut all of my parts in a single pass since my shaper spindle is not tall enough. In addition, the shaper cutter required to cut such a large surface would be very dangerous to use, even with a sturdy sled. I abandoned the idea of pattern shaping. 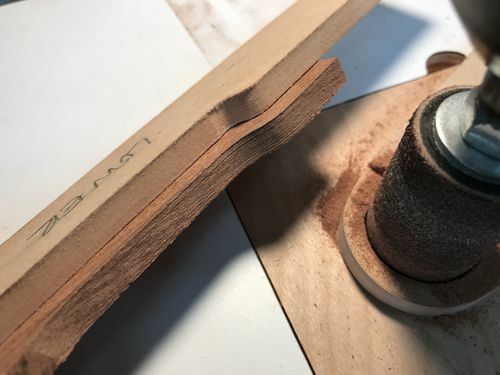 As I browsed the internet for alternative ways to consistently shape these parts, I came across a few people that had adapted spindle sanders to follow patterns. The concept of bandsawing away the majority of the waste and abrasively cleaning the parts up to a template appealed to me as being a safe way to get consistent, smooth results for these large parts (albeit a bit slow). The 6” tall spindles also have sufficient reach to shape the entire face of my parts. I decided to test the concept with a drill press mounted sanding drum before investing in a spindle sander. I bored a clearance hole in some scrap MDF slightly larger than the drum. After rounding the outside edge I had a quick and dirty pattern follower that will follow an offset template. I attached a template to a scrap of sapele with some double sided tape. The template rides face down on the table, against the pattern follower. After a few minutes sanding, I had a well shaped part, offset slightly from the template, without the usual irregularity associated with freehand use of a spindle sander. With my concept proven, I stopped at Woodcraft to pick up a spindle sander. 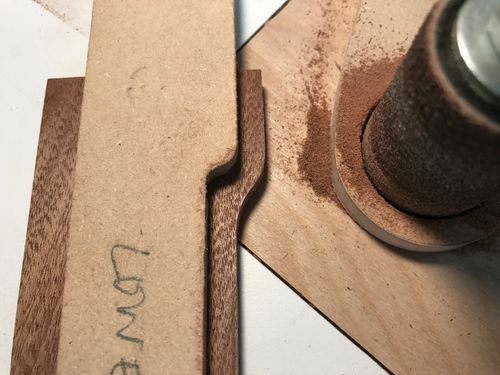 I need the tool in hand to get exact measurements of the sanding sleeves and throat plates so I can design my pattern follower and determine the offset for the templates. 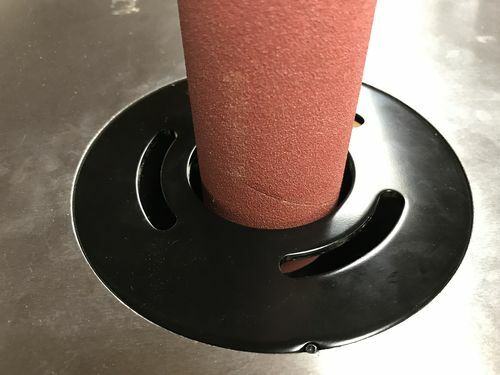 The 2 inch sanding sleeves are actually 2-1/16 outside diameter. The opening in the plate is 2-3/8. I’d like to use a 1/4 inch offset for my templates so my pattern follower will need an outside diameter of 2-9/16. I can turn a follower on the lathe that will press into the opening in the plate. I ordered a short length of 2 inch ID x 2-3/4 inch OD UHMW-PE tubing from McMaster Carr to fabricate the pattern follower from, but it could be made from a piece of hardwood or plywood as well. With my process for shaping the large parts worked out, I start working through the process flow for each part. With complex projects, I mentally work through the process steps to make each part, sketching as I go. 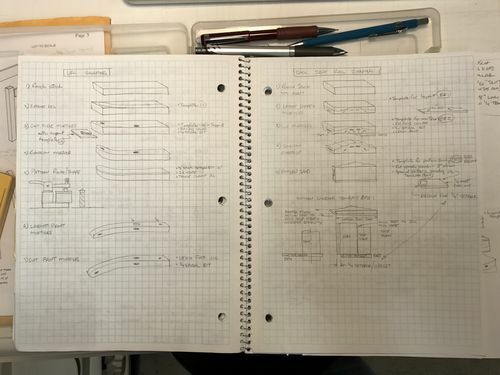 I find that even rough sketches help me to visualize the proper order to do the operations to get the best result. As I sketch, I’m thinking through the templates I will need as well as any tooling or special materials and I note them along the side. By thinking through the steps I can identify errors in my process order that might make a later operation difficult or impossible, all before I cut any material. Here, I am working through the process steps to make the back legs and back seat apron. Next Steps: Fabricate a pattern follower for the spindle sander, finish developing my process flow diagrams and finalize the templates in CAD. We also used the Domino 500 for several of the joints, which I don t own. tung I think for speed and reproductivity ya gotta go with with a pattern and use a flush trim bit to achieve repettative pieces.ive kinda gotten a love for spiral bits buddy.they make clean cuts and do it fast!just my opinion!in my opinion spindle sanders are to clean up the cuts not make them!good luck buddy. I will enjoy watching your progress. You’re off to a great start! Agreed, too bad they don’t make router bit that will produce a 5”cut! I will pattern route all the “low sides” of the parts with spiral bits. Cutting the wide faces is the issue. This photo shows the three parts in question- the center back slat is just under 5” wide at the base and the crest rail is nearly as large. The lower seat apron is 3-3/4” wide. I don’t have any equipment large enough to make that cut. I had hoped that I could cut most of it with a pattern setup on the shaper, then flip the part and use a top bearing setup following the cut I just made to finish it up, but my equipment just doesn’t have the capacity. Actually, everything we did with the Domino I can do with the Leigh FMT I already have, and I have more flexibility on the tenon size. Agreed, too bad they don t make router bit that will produce a 5”cut! I will pattern route all the “low sides” of the parts with spiral bits. Cutting the wide faces is the issue. This photo shows the three parts in question- the center back slat is just under 5” wide at the base and the crest rail is nearly as large. The lower seat apron is 3-3/4” wide. I don t have any equipment large enough to make that cut. I had hoped that I could cut most of it with a pattern setup on the shaper, then flip the part and use a top bearing setup following the cut I just made to finish it up, but my equipment just doesn t have the capacity. I hear ya bud,5” not that i know of sorry.but where theres a will there will always be a way!let me what that will is buddy!-lol.good luck! Dude, I was actually seriously jonesing for a blog entry when I found this this morning. I’m glad you resolved your patterning issue. If anyone deserves to buy a new tool (or two), it’s you. I haven’t drank the Festool kool-aid yet. I think it’s actually great to see you make such epic stuff without a $1,000 biscuit/plate joiner on steroids. It gives us mere mortals some hope. Looking forward to seeing the chairs develop. BTW, I’m breaking ground on my shop today! Dude, I was actually seriously jonesing for a blog entry when I found this this morning. I m glad you resolved your patterning issue. If anyone deserves to buy a new tool (or two), it s you. I haven t drank the Festool kool-aid yet. I think it s actually great to see you make such epic stuff without a $1,000 biscuit/plate joiner on steroids. It gives us mere mortals some hope. Looking forward to seeing the chairs develop. BTW, I m breaking ground on my shop today! Good luck with the shop, that’s a big project. I hope you made it twice as big as you think you need and allowed room for an addition later! Wow, these chairs have more manufacturing challenges than most. 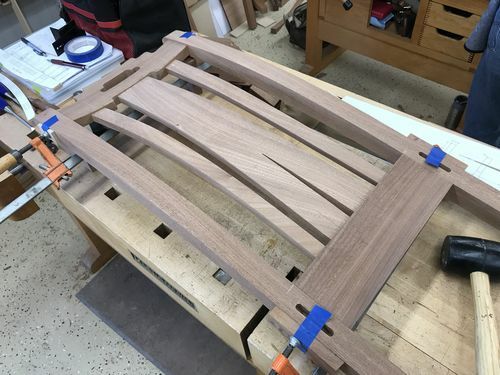 I have tried to pattern rout curved chair back parts up to 2” wide, but it didn’t feel safe. I think you are on the right track with a template sander attachment on the spindle sander. If that doesn’t pan out, maybe just a carbide bandsaw blade so it’s easier to sand to the line. I went to the Huntington Gardens in Pasadena over the weekend, where they have a Greene and Greene display. That, combined with all the Limbert and Stickley pieces at the Craftsman Weekend… my head is filled with inspiration for another year of woodworking. Yes, I saw that version too. That is pretty slick, but my spindles attach with a tapered seat so that would not work for me. The fixed pattern follow is easier to make as well. I have tried to pattern rout curved chair back parts up to 2” wide, but it didn t feel safe. I think you are on the right track with a template sander attachment on the spindle sander. If that doesn t pan out, maybe just a carbide bandsaw blade so it s easier to sand to the line. Shaper Feels dangerous to me as well, the sander will take longer but definitely safer. I’m still looking into using a Byrd helical head on the shaper, but I don’t think I can make the full cut. Visiting the Huntington Is on my list of things to do next time I’m on the west coast. A little late to the party here, but looking forward to seeing your process! By the way, unless you build a aircraft carrier-sized sled to pattern rout your parts, I think the spindle sander setup is the way to go. May take more time—but no need to get fingers reattached in the Emergency Room….........! Agree, I like my fingers just the way they are! I do plan to pattern route some of the smaller parts, but for the tall parts I think the sander is the safer way to go.